sqadia.com brings into reflection a medical lecture on human teeth delivered by anatomy demonstrator, Warda Naz. 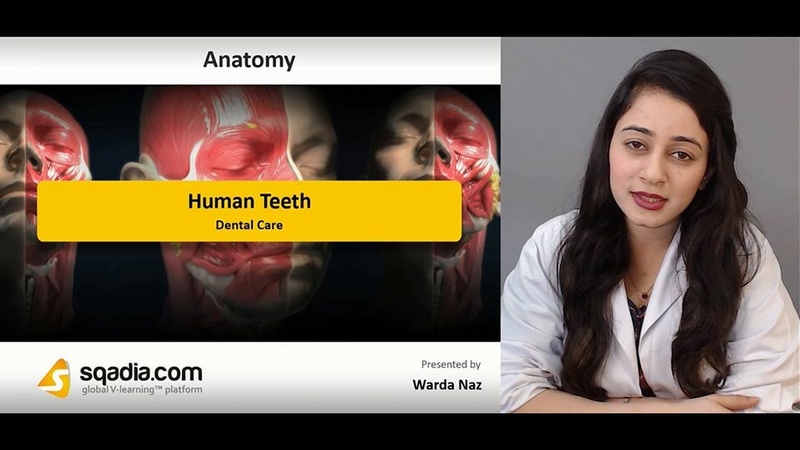 This lecture explains the parts of teeth which are crown, neck and root. four types of teeth i.e. incisor, canine, premolar, molar is discussed along with their functions. Information about anatomy is delivered. Also, it is discussed that how to prevent tooth decay. The lecture human teeth primarily focus on the structure of teeth. Teeth are small, calcified, hard, whitish structures found in the mouth for mechanically breaking down items of food by cutting and crushing them. Function of teeth is biting, crushing, or breaking food. Structurally, teeth are divided into three main parts i.e. crown, neck and root. Crown part of teeth is located above the gum. Neck part of teeth is between crown and root. Root part of teeth seen inside the gum. Beginning with the composition of teeth. It is made of dentine. It is a hard calcium rich material but less hard than enamel. It disintegrates easily. There are four types of teeth. Incisors are four front teeth in both upper and lower jaws which helps in cutting and biting. Canines have a sharp, pointy surface for tearing food. Canines lie behind and adjacent to lateral incisors. Premolars are located behind and adjacent to the canines. Molars are designed to grind food. These are most posterior teeth in mouth. 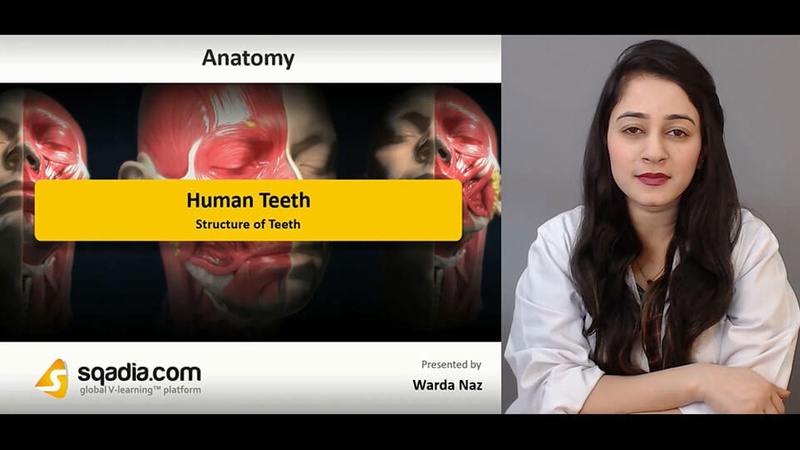 For the better understanding of medical students, in depth elaboration is given on anatomy of teeth. Each tooth is made up of the same four components: enamel, dentin, cementum and pulp. Enamel is the substance that covers the anatomic crown of the tooth, is the hardest substance in the body. The dentin is the substance that lies beneath the enamel and the cementum in the tooth. 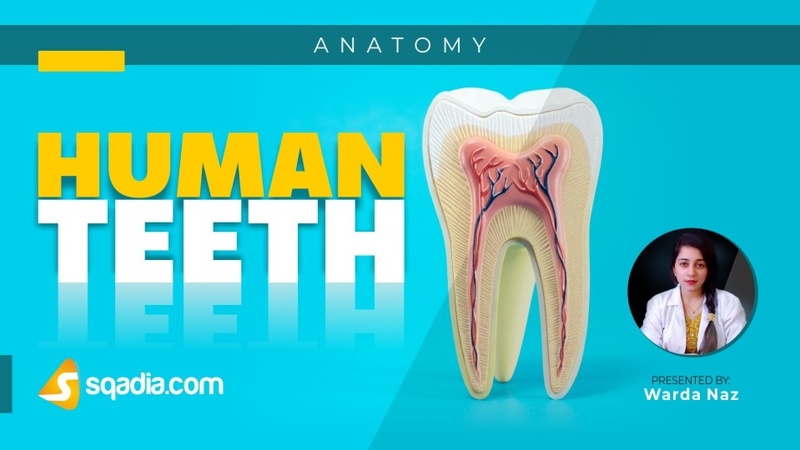 The cementum is the substance that covers the root of the tooth. It has a similar hardness to bone. The pulp is the final component, and it is where all the nerves and blood vessels that supply the tooth are housed. Alveolar bone is the jaw bone supporting tooth. Milk teeth and permanent teeth are differentiated on the basis of color, size, and teeth quality. 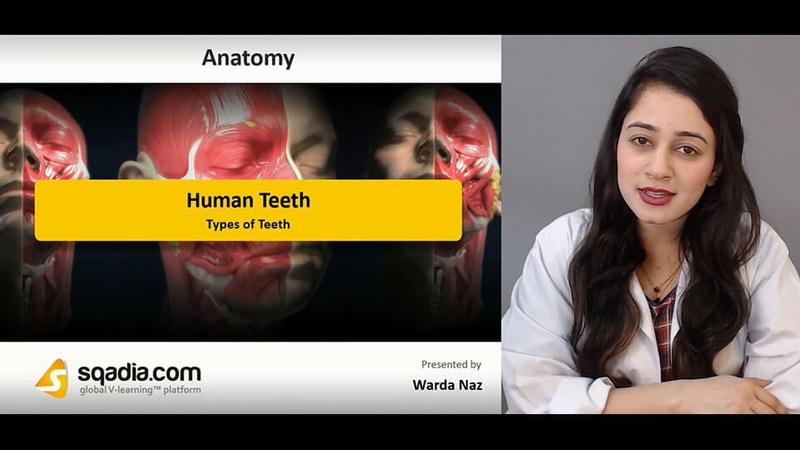 In this section of medical video lecture human teeth, Warda Naz delivers medically significant information on tooth decay. Plaque is a biofilm consisting of large quantities of various bacteria that form on teeth. If it is not removed regularly, it leads to the periodontal problems such as gingivitis. Streptococcus mutans are associated with dental caries. At sqadia.com, anatomy demonstrator also elaborates the dental formula for the ease of medical students. Dental formula is a formula expressing the number and kinds of teeth possessed by a mammal. It is written in the form of four fractions. The section dental care is a demonstration for medical, MBBS, BDS students and also for general public to get aware how to protect their tooth by taking simple yet medically important measures. Tooth care is a means of preventing dental caries, gingivitis, periodontal disease, bad breath, and other dental disorders. Tooth care can be accomplished by brushing teeth twice in a day, by regular dental check. Medical care provider at sqadia.com also sheds light on foods good for teeth and these include cucumber, apples, cheese, strawberries, carrots. Foods causing tooth decay are also considered and include starchy refined carbohydrates.